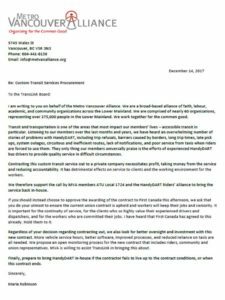 Today, the Metro Vancouver Alliance sent this letter to the TransLink Board. It is great to have so many allies from diverse groups! Download a PDF of the letter here! I am writing to you on behalf of the Metro Vancouver Alliance. We are a broad-based alliance of faith, labour, academic, and community organizations across the Lower Mainland. We are comprised of nearly 60 organizations, representing over 275,000 people in the Lower Mainland. We work together for the common good. Transit and transportation is one of the areas that most impact our members’ lives – accessible transit in particular. Listening to our members over the last months and years, we have heard an overwhelming number of stories of problems with HandyDART, including trip refusals, barriers caused by borders, long trip times, late pick ups, system outages, circuitous and inefficient routes, lack of notifications, and poor service from taxis when riders are forced to use them. They only thing our members universally praise is the efforts of experienced HandyDART bus drivers to provide quality service in difficult circumstances. Contracting this custom transit service out to a private company necessitates profit, taking money from the service and reducing accountability. It has detrimental effects on service to clients and the working environment for the workers. We therefore support the call by MVA members ATU Local 1724 and the HandyDART Riders’ Alliance to bring the service back in-house. If you should instead choose to approve the awarding of the contract to First Canada this afternoon, we ask that you do your utmost to ensure the current union contract is upheld and workers will keep their jobs and seniority. It is important for the continuity of service, for the clients who so highly value their experienced drivers and dispatchers, and for the workers who are committed their jobs. I have heard that First Canada has agreed to this already. Hold them to it. Regardless of your decision regarding contracting out, we also look for better oversight and investment with this new contract. More vehicle service hours, better software, improved processes, and reduced reliance on taxis are all needed. We propose an open monitoring process for the new contract that includes riders, community and union representatives. MVA is willing to assist TransLink in bringing this about. Finally, prepare to bring HandyDART in-house if the contractor fails to live up to the contract conditions, or when this contract ends.